Rabbi at Salonica at the beginning of the sixteenth century. 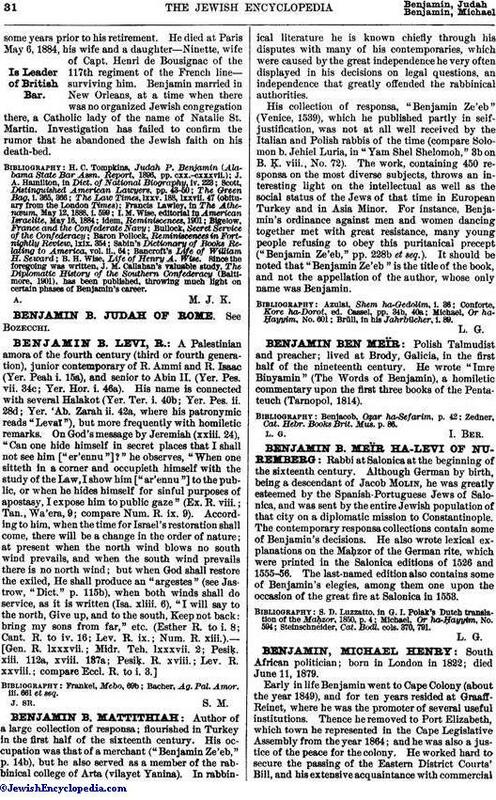 Although German by birth, being a descendant of Jacob Molin, he was greatly esteemed by the Spanish-Portuguese Jews of Salonica, and was sent by the entire Jewish population of that city on a diplomatic mission to Constantinople. The contemporary responsa collections contain some of Benjamin's decisions. He also wrote lexical explanations on the Maḥzor of the German rite, which were printed in the Salonica editions of 1526 and 1555-56. The last-named edition also contains some of Benjamin's elegies, among them one upon the occasion of the great fire at Salonica in 1553. Steinschneider, Cat. Bodl. cols. 370, 791.